If hours in the kitchen are an ebb and flow, it's ebb time around here. Burritos, rice, tuna melts, an apple distractedly cut and distributed, groceries ordered online at midnight. Thankfully, miraculously, I'm busy with work. When I'm not doing it, I'm thinking or dreaming about it. Or taking a cake-baking break . Baked this for a fundraiser last weekend, and it was sold in minutes. (Horn-tooting! My own horn!) Then I came home and regretted not having any for myself. So I made this version, kid-friendly, without nuts or chai or those meddlesome dried fruits. Now I'm working in the library, dropping crumbs all over my keyboard, scheming about getting back to the kitchen. It comforts me just to think about it. Fall in a slice. Gone in a flash. Preheat oven to 350. If you have a convection oven (I do. How I adore it. 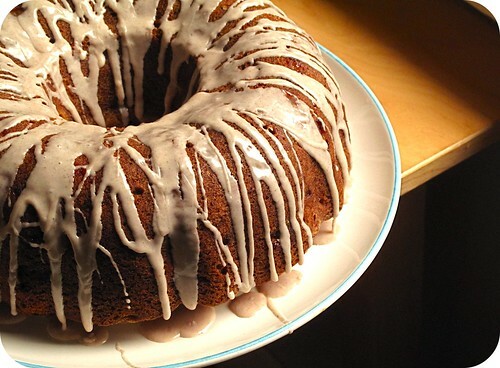 ), bundt cakes are good things to use them on so the outside doesn’t get a lot more done than the inside. If you don’t have convection, just watch it carefully. Mix flour, soda, salt, and cinnamon together in a medium bowl. In a large bowl, mix sugars, vegetable oil, eggs, and brandy. Add flour mixture and mix until just combined. Add apples and stir until just combined. Spoon into bundt pan and bake for about 60 minutes (maybe longer, depending on your oven), or until an inserted skewer comes out with a few moist crumbs on it. Let cool in pan for 20 minutes, then turn out onto a plate. For glaze, whisk powdered sugar and milk together, adding a little more if needed. You want it so it's just barely pourable. Spoon over cake after cake has cooled.